Menashe P. Miller has many roles: rabbi, chaplain, husband, father, and municipal official. He also has many jobs, all part-time. In addition to serving as a military chaplain and the deputy mayor of Lakewood, he works as director of government affairs for Chemed, a Lakewood-based, federally funded health facility that, among other things, treats underinsured and uninsured patients. And he teaches evening courses in Jewish studies. And he assumed his newest role, lieutenant colonel in the U.S. Air Force, in a promotion ceremony on Nov. 19 at Joint Base McGuire-Dix-Lakehurst, where he serves with the 87th Air Base Wing. “My job as a chaplain supersedes all my other activities,” he told NJJN in a phone interview. “When the military needs me, I go, and put the other things on hold. Commissioned in 2002 as a second lieutenant, Miller, now 43, has been under fire in overseas war zones and has worked with individuals of various religious backgrounds from all branches of the military. He has offered spiritual guidance and comfort; counseled servicemen and women suffering from post-traumatic stress disorder; and helped Jewish soldiers, sailors, Marines, and Air Force personnel keep the faith under difficult conditions. Concerning his political career, Miller, a Republican, said he is now in his 15th year as a member of the Lakewood Township Committee. Running every three years, he has won five consecutive campaigns. “In our system, committee members change jobs every 12 months. I’ve been mayor four times and deputy mayor four times,” he said. Born in Lakewood, Miller lived there until he was 14, then spent three years as a boarding student at the Mesivta of Long Beach in New York’s Nassau County. He then moved to Israel and attended the Mir Yeshiva in Jerusalem for two years. After his return to New Jersey, he enrolled at Beth Medrash Govoha in Lakewood, where he earned a master’s degree in talmudic studies. 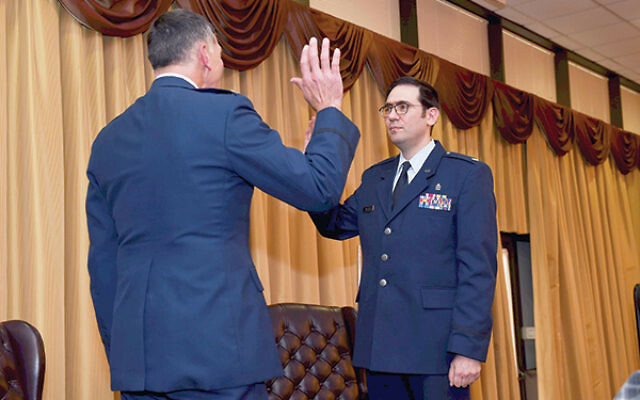 “Because I had that advanced degree, I was able to be commissioned as a second lieutenant at virtually the instant I enlisted in 2002,” Miller said. Rising through the ranks, he went to Maxwell Air Force Base in Montgomery, Ala., in 2004 and completed a Commissioned Officers Training School program. That resulted in an immediate promotion to first lieutenant. A captain’s bars appeared not long after, and then a major’s gold oak leaf cluster. Commenting on his multifaceted career, Miller said he often finds that skills needed for one activity prove to be useful in another. One example: He was named Lakewood’s mayor in the fall of 2010 but had to go overseas for six weeks to fulfill his chaplaincy service in Iraq before taking office. His return coincided with the fatal shooting of Lakewood policeman Christopher Matlosz, who was 27 and engaged to be married. The perpetrator was from outside the Lakewood area. However, Miller said, the use of MRI technology to perform non-invasive autopsies have become more common, so much so that it has even been accepted by Orthodox authorities.